The islands in the State of Hawaii are the equivalent of the difference between living in Los Angeles or San Francisco in the State of California. The distances may be shorter in some cases, but we do after all, have to fly between them. Once we know what island you are on, we might care if you are east, west, north, south shore – but except for a few big, easy to identify cities like Honolulu and Hilo, city info is not that useful. 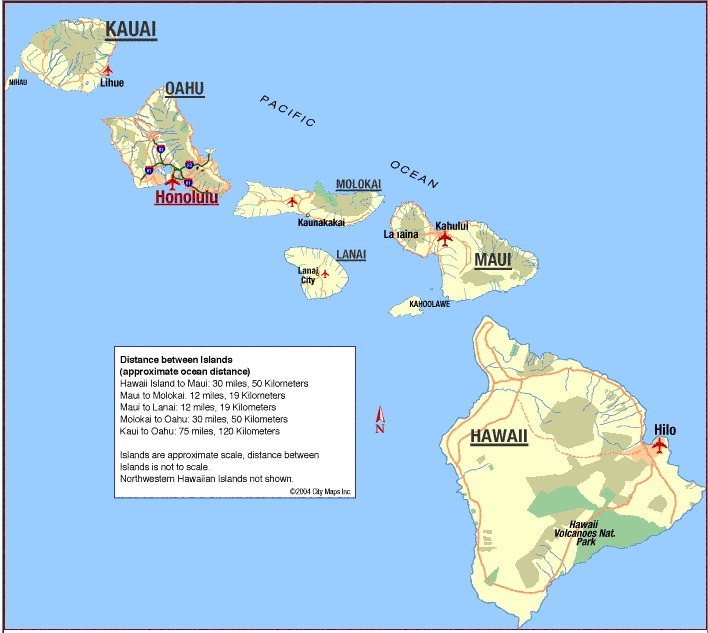 Not to mention that some city names, like Waimea, are repeated on different islands. Facebook only allows members to list a city and state in their profile location. Local search and geomarketing which benefits from zip codes, computer IP’s and geolocation platforms like Yelp for iPhone is related but a different issue. Thank you to accessmaps.com for the map. Note distance between islands is not to scale.